Is it Magnesium That Makes Our Earth Magnetic? 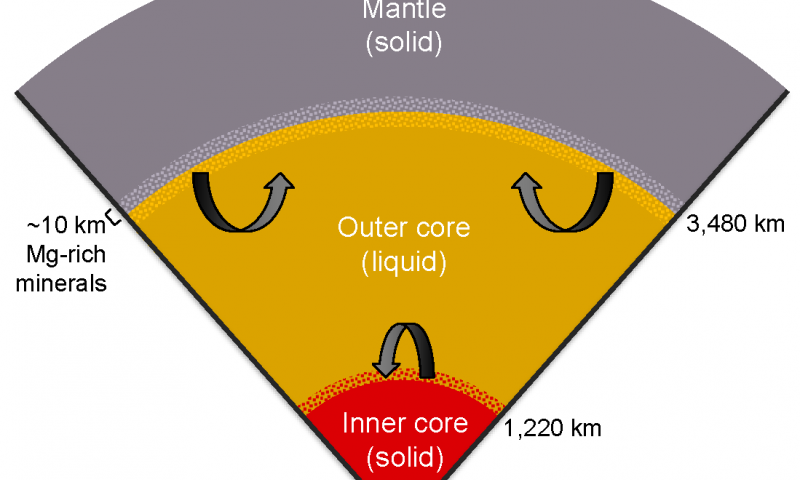 For many years, scientists have believed that the Earth’s magnetic field is likely generated by energy that is released as the core cools and material solidifies. But, there is a problem with that idea, scientists also believe that the core did not cool enough to form an inner core, until approximately one billion years ago. In their paper published in the journal Nature the scientists suggest that 1 percent of magnesium that made its way to the core of the planet could be the key to understanding how the magnetic field was generated in the past and what drives it in the present. Because magnesium is only soluble in iron at very high temperatures, they believe that it is slowly precipitating out to the boundary between the core and the mantle. That process would leave the iron behind denser, which would cause the release of energy, which they suggest could explain the power source behind the dynamo. This interesting theory relies on understanding the compositional changes of a system with time and temperature. It is very similar to analyses proposed and investigated every day by our users of microanalysis products on modern materials. It is remarkable that the same techniques are proposed for understanding both planetary core dynamics and nanotechnology. * Powering earth’s dynamo with magnesium precipitation from the core. A New Year and a New Market! The landscape of the microscopy and microanalysis field has been changing for years. In the EDAX Application Labs we see this change throughout most of our activities such as system demos, training courses and customer support. The trend shows that many users are 1) looking for ways to increase their productivity due to increased workload demand and 2) using multiple tools in combination to solve their increasingly diverse, yet still deeply scientific, applications. The result is the growing need for Quick & Easy solutions in microanalysis – which also happens to be the topic of my recent webinar! The latest addition to our Mahwah applications lab is a tabletop SEM, which we added at the end of last year. This offers simplicity of use without a compromise in the quality of the analysis, which is remarkable enough for both this blog and the related webinar. Raw materials verification is a common materials application in a variety of industrial settings. Typically the analysis requires image collection, spectral collection and analysis, quantification and then data interpretation. Experienced analysts can spend time reviewing the results to determine what the material is, and whether the concentrations are within acceptable limits. But with the new tools available for these new market environments, there’s a better way. 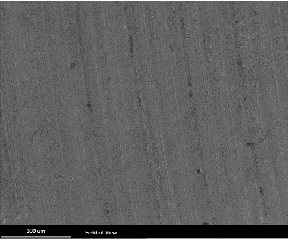 Figure 1 shows an image of a block of raw steel. In order to quickly and conclusively determine the specific type of steel, nowadays all the analyst needs to do is collect a quick spectrum and click the “Match” button. The software then compares the unknown material to a user’s previously collected alloy library. 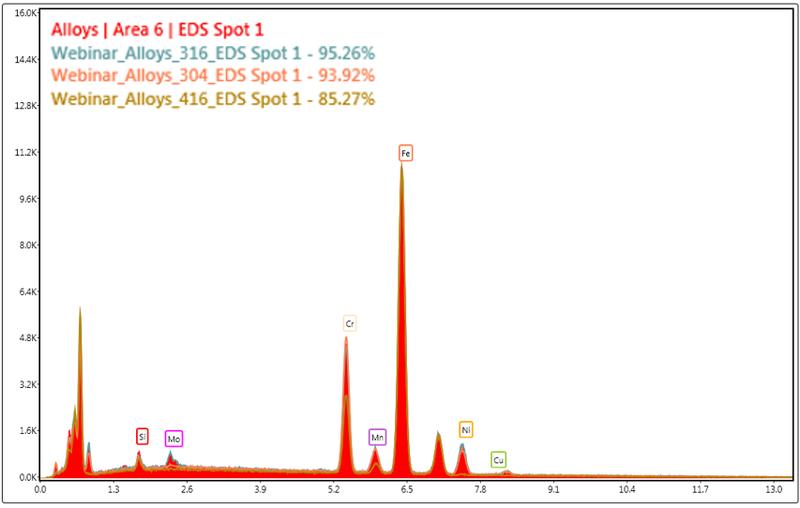 The routine matches the spectral fingerprint and doesn’t even require a peak identification or quantitative analysis. 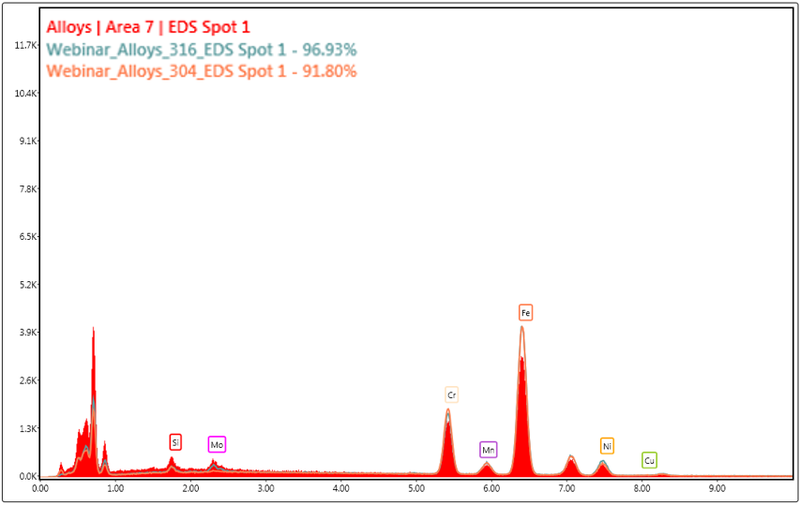 The results in Figure 2 show the red unknown spectrum matched to the three closest results in the alloy library. 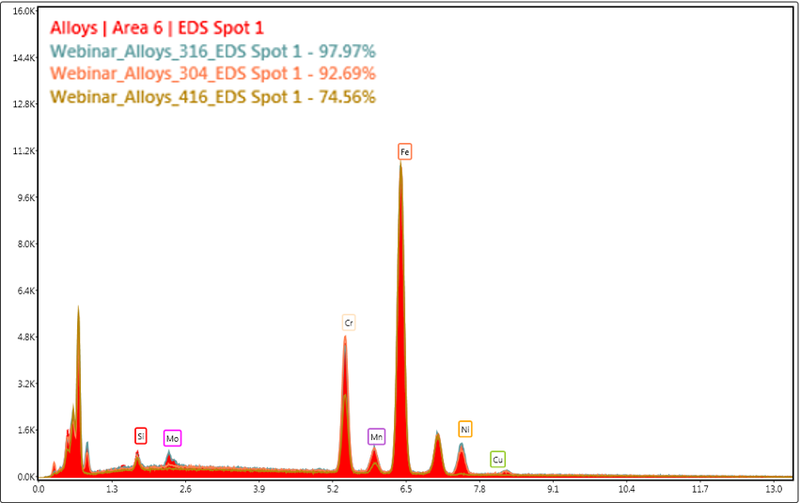 Values show the percentage of the match, giving an even better metric to report, and in this case the material is identified as SS 316. The quality of the solution can be further increased by performing a peak ID and using the match routine on the concentration results. In this case Figure 3 shows a % match of concentration to SS316. An added benefit of this option is that the sample spectra collection conditions (kV, system configuration etc.) can be different from the library conditions, such as 15 kV sample collection conditions compared to a 20 kV library, (see Figure 4). This increases analytical flexibility while still maintaining quality results. The results show that a confident and conclusive raw materials verification analysis can now be accomplished in just a few mouse clicks without the need for time consuming interpretation by an analyst. So when you want quality results quickly, check out the new software available for your best solutions!